Even when updating to the iOS 12 version, but many iOS users are still encountering problems with playing YouTube Videos in Background on their device. 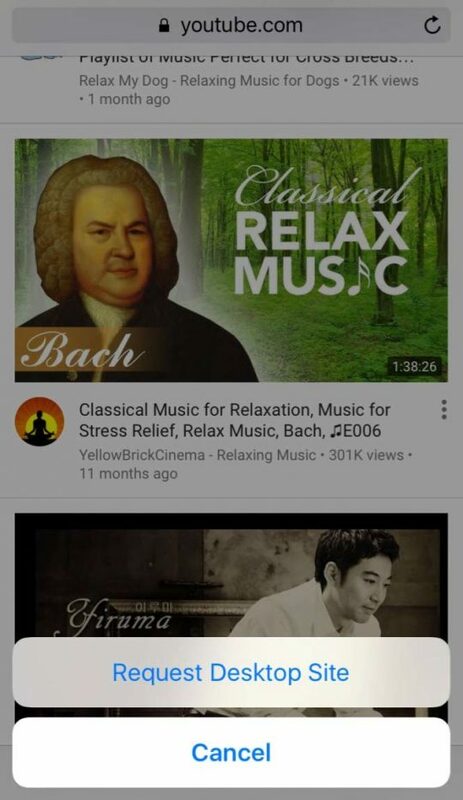 YouTube has already enforced their policy that users cannot do anything while listening to YouTube music, podcasts. Additionally, YouTube have also disabled background playing to push their new product, YouTubeRed. 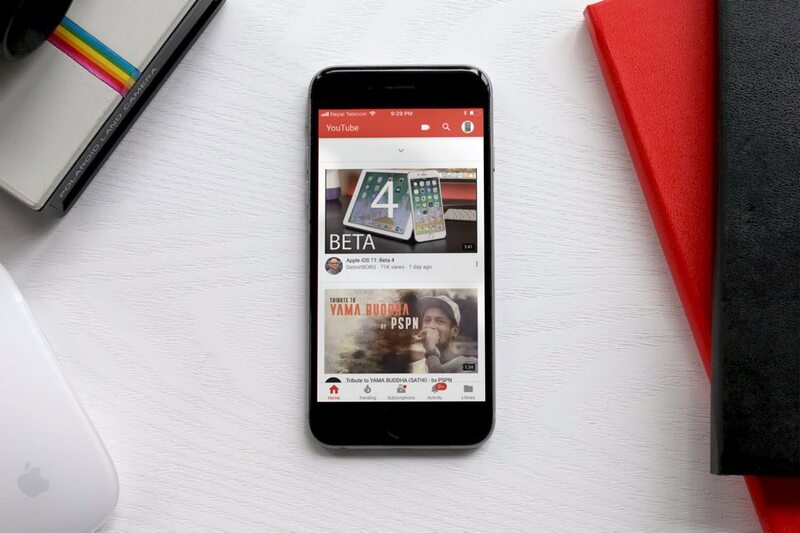 If you like listening to YouTube music video without watching the content, we are going to show you how to play YouTube videos in your iPhone background without the need for subscribing to YouTubeRed Premium. We write this post since we know additional ways and methods to play YouTube in the background. So, you should not give up if the first method doesn’t help you. Scroll down the list of suggestions and you will find the best one for you. You can use Dolphin, Opera Mini, or Mercury Browser as your preferred browser to play the YouTube videos as opposed to Chrome or Safari browsers. If YouTube’s audio stops, you simply return to the Home screen, open up music controls in Control Center and reinitiate playback. The music will now stop playing, open up Control Center and tap on the play button on the music player tab to resume playing music. Your YouTube video will now play in the background, even when your screen is off or locked! 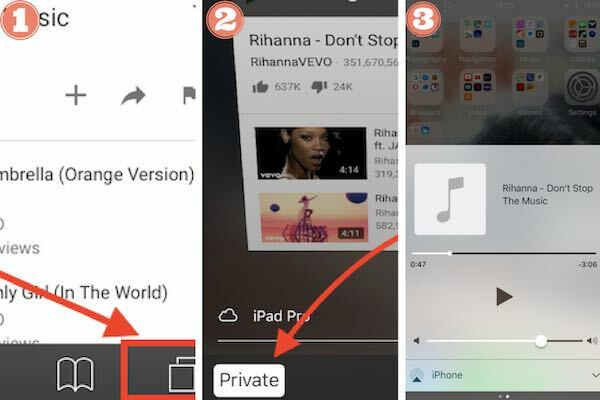 If you watch YouTube in Safari browser, you should use a Private Browsing option to play your favorite YouTube music in the background. To do so, simply follow these steps below. Launch your Safari browser and visit YouTube.com. Next, search for the video that you want to play in the background. Now, change the Safari browser session to a Private session just by tapping on the square icon at the right bottom corner. Next, tap on Private and tap Done to confirm your selection. It will now open up the YouTube video in a private session. Once the private session is ON, Safari will be dark instead of the normal white. 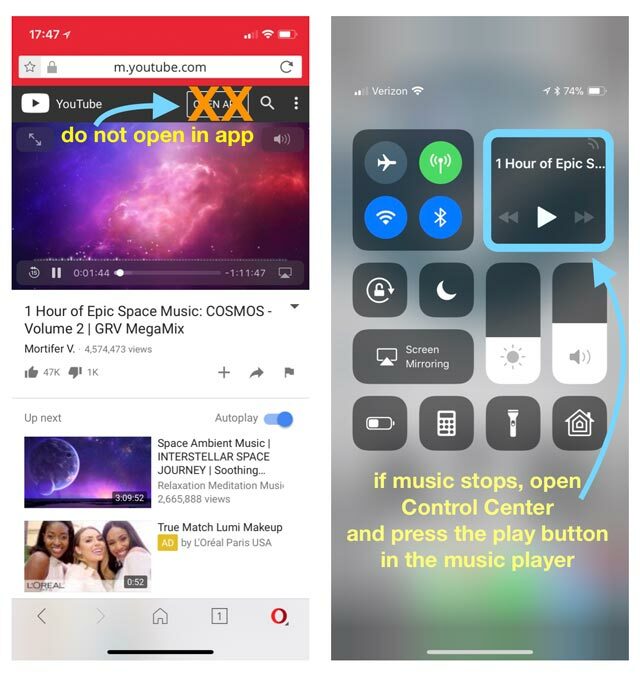 When the video starts playing, quit Safari browser and open Control Center by swiping up from the bottom of the screen or the top right corner (for iPhone and later models). Simply tap on Play button to continue playing the video in the background. Due to some reasons, your Safari cannot pipe YouTube videos in Private browsing mode, you should clear the website history of Safari by going to Settings > Safari > Delete History and Website Data. In the Safari Settings, toggle Block Pop-Ups switch to ON. After you have cleared the Safari history, restart your iPhone and then load YouTube videos in Private Safari session and check if you can play video in the background. Some iOS users report success with third-party apps to play YouTube videos in the background. These are apps like YTB Player, ProTube, and others. All of them can be found on the App Store. That said, when you use these apps, wait until the advertisement completes and your favorite video will start playing before you return to the Home screen to open other apps. Choose your favorite videos, tap on the three-dot icon at the bottom and select “Add LocaPlaylist”. Now, create a new Playlist through “Create New Playlist” option and add your favorite clips into the Playlist. To play it, tap on the menu icon and select “Local Playlist” > your playlist and then enjoy your music while the screen is locked. Another trick to play YouTube in the background is requesting YouTube’s Desktop Site from the browser. For Safari browser, visit youtube.com, and tap and hold on Refresh symbol in the address bar. Doing so will open up the Request Desktop Site option. Another way to activate “Request Desktop Site” in Safari is through the Share Button. Tap on it and swipe through the row until you see the Request Desktop Site button. After Desktop Site starts loading, locate your favorite video and press Play. Depending on the selected content, it could load ads first. When the video is playing, open up control center and double tap on Home to return to your Home Screen. All mobile browsers offer a way to their Desktop Site. If you are using Chrome, simply tap on the three vertical dots in the top right corner, which is Settings Menu button. Next, choose Request Desktop Site from the available options. After that, you simply follow the same instructions for Safari browser. Above the possible ways of playing YouTube in the background on your iPhone without registering YouTubeRed. If you feel this post useful, let’s know in the comment below and share it to social networks.